De Vos A, Bruning B, van Straten G, Oosterbaan R, Rozema J, van Bodegom P (2016): Crop salt tolerance. Rozema J and Flowers T (2008): Crops for a salinized world, Science Mag AAAS. Prof. Dr. J. Rozema is associated with Salt Farm Texel as an independent scientific advisor. Picture: A salty world. 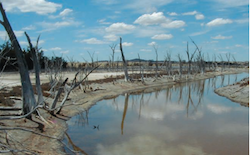 The effects of salinization (and increased flooding) in the Yenyening lakes system in the Shires of Quairading and Beverly, Western Australia. Van Straten G, De Vos A, Vlaming R, Oosterbaan R (2016): Field tests of dielectric sensors in a facility for studying salt tolerant crops. International Agricultural Engineering Journal 25, 102-113. Bruning B (2016). Symbiotic nitrogen fixation in legumes in response to salinity and the impact for saline agriculture. Thesis VU University Amsterdam, The Netherlands. Bruning B, van Logtestijn R, Broekman R, de Vos A, Parra Gonzalez A, Rozema J (2015). Growth and nitrogen fixation of legumes at increased salinity under field conditions: implications for the use of green manures in saline environments. AOB plants, The Open Access journal for plant sciences, special issue: Physiology and ecology of halophytes-plants living in salt-rich environments. Rozema J, Cornelisse D, Zhang Y, Li H, Bruning B, Katschnig D, Broekman R, Ji B, van Bodegom P (2014). Comparing salt tolerance of beet cultivars and their halophytic ancestor: consequences of domestication and breeding programmes. AOB plants, The Open Access journal for plant sciences, special issue: Physiology and ecology of halophytes-plants living in salt-rich environments. De Vos A, Broekman R, De Almeida Guerra C, Van Rijsselberghe M, Rozema J (2013). Developing and testing new halophyte crops: a case study of salt tolerance of two species of the Brassicaceae, Diplotaxis tenuifolia and Cochlearia officinalis. Environmental and Experimental Botany 92, 154-164. Perez-Harguindeguy N, Diaz S, Garnier E, De Vos A ,........., (2013). New handbook for standardized measurement of plant functional traits worldwide. Australian Journal of Botany 61, 167-234. Rozema J, Schat H (2013). Salt tolerance of halophytes, research questions reviewed in the perspective of saline agriculture. Environmental and Experimental Botany 92, 83-95. Bruning B, Rozema J (2013). Symbiotic nitrogen fixation in legumes: perspectives for saline agriculture. Environmental and Experimental Botany 92, 134-143. De Vos A, (2011). Sustainable exploitation of saline resources. Ecology, ecophysiology and cultivation of potential halophyte crops. Thesis VU University Amsterdam, The Netherlands. De Vos A, Broekman R, Groot M, Rozema J (2010). Ecophysiological response of Crambe maritima to airborne and soil borne salinity. Annals of Botany 105, 925-937.